Those who are thinking about facial contour surgery will agree. A 90 degree angled square jaw and a short receding chin. but I was really stressed because of my hooked nose that was too short and upturned. my receding chin got worse as I got older. Sometimes I heard I looked absentminded or pouty. My nickname was big beak parrot. but I wanted to live with a confident and pretty face. So I decided to get nose and facial contouring surgery. I went around looking for a hospital and I was convinced that I could trust Braun to change my face. Her head is not big and her hairline is good with a beautiful forehead. She also has pretty big eyes with double eyelids and dark eyebrows. and had a good ratio of upper and lower lips. and the side part of the cheekbones protruded a lot. her nose was hooked, short, and upturned. and had a bad profile especially due to the severe hooked nose and receding chin. Transformed into a lovely girl from a chubby girl next door! My boyfriend would be surprised knowing that my high school nickname was a big beak parrot. ugly shaped chin, but now I love taking pictures! I can also do up hair styles that looks good on small faces! In my head, I told myself ‘I will get pretty’ so many times. Like everybody else, I couldn’t sleep before the surgery. I was more excited than feeling uneasy! I imagined my pretty face when I was going to the clinic with my mom. During the last consultation with my doctor before the surgery, I relaxed and went into the operation room. I felt like I had a quick nap and I was in the recovery room. but it was hard to breathe and I felt nauseated. It wasn’t painful, but because of the cotton ball in my nose, I couldn’t breathe well and I was thirsty. went great so that made me feel much better. I was worried about swelling since I did nose and contouring surgery together, but it wasn’t bad at all. For about 3 days I was swollen, but after that it got better quickly every day, which made me excited! I think it’s because of the pumpkin juice and some medication the clinic gave me for swelling. frequency treatment and swelling treatment. On the fifth day, my nose bandage and some stitches were removed. After cleansing and laser, I felt like my face was getting lighter. Because of follow up care from Braun, my swelling went away quickly! I think the medication for swelling I took every morning was definitely part of it. now I have a soft image. I feel like I am feminine now! recovery process not to have sensation for a month or two, so I felt relived. And my doctor said my swelling was going away quickly which made me happy. I am so excited to live with my V facial line. Every day I get happier. I told my doctor that I want a pretty but natural face. And he did exactly what I wanted. I eat well and I am doing fine without any discomfort! Whenever I take a selfie, I get surprised. My chin line is great and my nose got prettier. I am so happy that I don’t need photoshop for my pictures. and all my acquaintances see my face and they get impressed. Especially, I heard that if I got surgery for my eyes. They say my eyes look bigger and clear making my face more 3 dimensional! When they ask me how I got pretty so naturally, I boast about Braun. The world is going around with me at the center. It's been 6 months already! I take pictures every month and compare them. As time goes on, my face gets smaller and pictures come out better! My favorite thing is that I got naturally pretty! scolding me that I can’t be more beautiful than the bride. but I am glad that my operation went great safely without any side effects. I got pretty thanks to a clinic that is well known for its contouring and nose surgery. I wondered why patients do THANKS TO the doctors but now I know why! The collaboration of Dr. Tae-gyu Kim and Dr. Jung-hoon was the best! 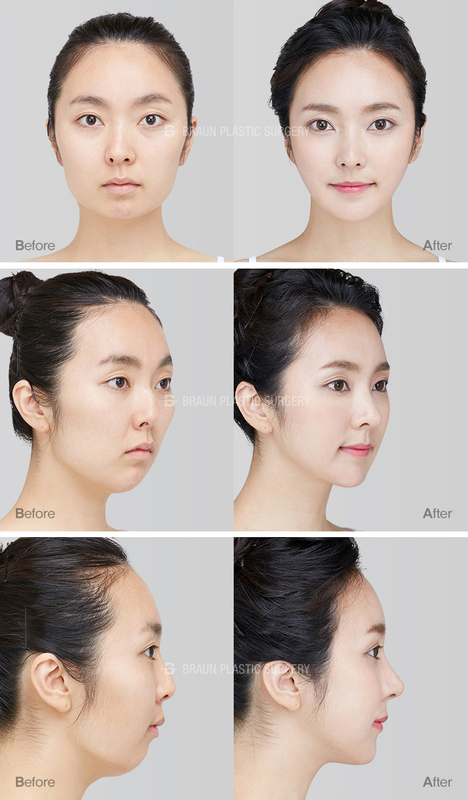 I recommend Braun, specialized in contouring and nose surgery!! I thank you for making my face look so beautiful, making me reborn! !